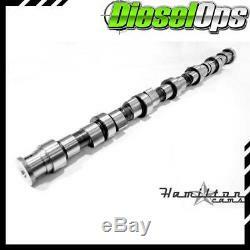 Hamilton Cams Extreme Steel Billet Camshaft for Dodge Cummins 5.9L/6.7L 98.5-16. Extreme duty version of the 178/208. This cam produces the most torque of any cam we offer when coupled with a larger single charger. This cam will give you excellent drivability and response in the power band of a street truck. Towing wit a large single turbo is now possible with this cam. This cam can be ran with no modification in a 2003 and up block with two factory cam bushings. This Cam works both for the 5.9L Cummins and the 6.7L Cummins. Ram 2500 5.9L Cummins 24V. 1998, 1999, 2000, 2001, 2002. Ram 2500 TRX4 5.9L Cummins 610. Ram 2500 5.9L Cummins 600. Ram 3500 5.9L Cummins 24V. Ram 2500 Custom 5.9L Cummins 24V. Ram 3500 5.9L Cummins 600. Ram 2500 Laramie 5.9L Cummins 610. Ram 3500 Laramie 5.9L Cummins 610. Ram 2500 Laramie 6.7L Cummins. Ram 3500 Laramie 6.7L Cummins. Ram 2500 SLT 5.9L Cummins 600. Ram 3500 SLT 5.9L Cummins 600. Ram 2500 SLT 5.9L Cummins 610. Ram 3500 SLT 5.9L Cummins 610. Ram 2500 SLT 6.7L Cummins. Ram 3500 SLT 6.7L Cummins. Ram 2500 SLT Night Runner Sport 5.9L Cummins 610. Ram 3500 Sport 5.9L Cummins 610. Ram 2500 SLT Sport 5.9L Cummins 610. Ram 3500 Sport 6.7L Cummins. Ram 2500 Sport 5.9L Cummins 610. Ram 3500 ST 5.9L Cummins 600. Ram 2500 ST 5.9L Cummins 600. Ram 3500 ST 5.9L Cummins 610. Ram 2500 ST 5.9L Cummins 610. Ram 3500 ST 6.7L Cummins. Ram 2500 ST 6.7L Cummins. Ram 3500 SXT 6.7L Cummins. Ram 2500 SXT 6.7L Cummins. Ram 3500 TRX4 5.9L Cummins 610. 2500 Big Horn 6.7L Cummins. 3500 Big Horn 6.7L Cummins. 2500 Laramie 6.7L Cummins. 2011, 2012, 2013, 2014, 2015. 3500 Laramie 6.7L Cummins. 2500 Laramie Limited 6.7L Cummins. 3500 Laramie Limited 6.7L Cummins. 2500 Laramie Longhorn 6.7L Cummins. 3500 Laramie Longhorn 6.7L Cummins. 2500 Lone Star 6.7L Cummins. 3500 Lone Star 6.7L Cummins. 2500 Outdoorsman 6.7L Cummins. 3500 SLT 6.7L Cummins. 2500 SLT 6.7L Cummins. 3500 ST 6.7L Cummins. 2500 ST 6.7L Cummins. 3500 SXT 6.7L Cummins. 2500 SXT 6.7L Cummins. 3500 Tradesman 6.7L Cummins. 2500 Tradesman 6.7L Cummins. The User purchasing this product acknowledges and hereby indemnifies and saves harmless Diesel ops, LLC. Its officers, employees, agents, distributors and dealers for any damages, penalties, fines, expenses or other costs which may arise from the use of this product and without limiting the generality of the forgoing specifically acknowledges the following. Use of this Product for purposes other than solely for competition is a violation of federal law and may violate applicable state or local environmental, motor vehicle and other laws. The User warrants that the product shall only be used in sanctioned closed-circuit events. That use of this Product may make the Vehicle unfit or unsafe for the purposes intended or for any purpose and cause personal injury, property damage or death. That the installation of this Product, improper installation of this Product, use of this Product with other components or failure to use this Product in conjunction with other components, could result in or cause personal injury, property damage or death. THIS PRODUCT IS FOR COMPETITION USE ONLY. ALL OTHER USES ARE CONTRARY TO FEDERAL LAW. Diesel Ops is here to assist you! The item "Hamilton Cams Extreme Steel Billet Camshaft for Dodge Cummins 5.9L/6.7L 98.5-16" is in sale since Wednesday, December 6, 2017. This item is in the category "eBay Motors\Parts & Accessories\Car & Truck Parts\Engines & Components\Camshafts, Lifters & Parts". period" and is located in Oakland, Michigan. This item can be shipped to United States, Canada, United Kingdom, Denmark, Romania, Slovakia, Bulgaria, Czech republic, Finland, Hungary, Latvia, Lithuania, Malta, Estonia, Australia, Greece, Portugal, Cyprus, Slovenia, Japan, China, Sweden, South Korea, Indonesia, Taiwan, South africa, Thailand, Belgium, France, Hong Kong, Ireland, Netherlands, Poland, Spain, Italy, Germany, Austria, Israel, Mexico, New Zealand, Singapore, Switzerland, Norway, Saudi arabia, Ukraine, United arab emirates, Qatar, Kuwait, Bahrain, Croatia, Malaysia, Brazil, Chile, Colombia, Costa rica, Panama, Trinidad and tobago, Guatemala, Honduras, Jamaica.